This dessert is the perfect flavor of spring: sweet from strawberries and tart from the rhubarb. 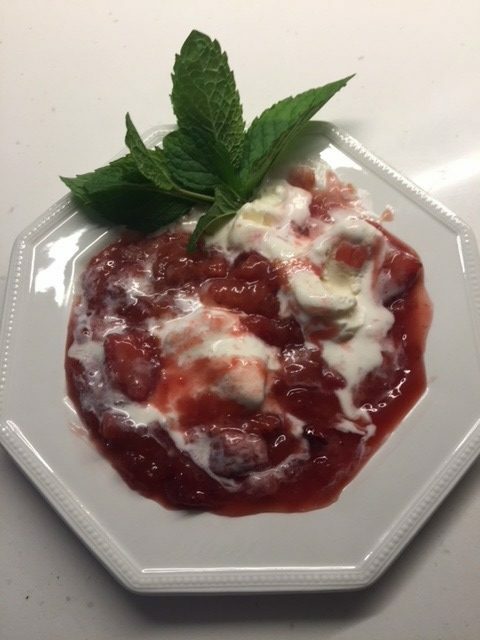 In a large bowl, combine the rhubarb, strawberries, granulated sugar, orange zest, cornstarch, and orange liqueur, and toss to thoroughly to combine. Grease a 9 by 13-inch casserole or baking dish with 1 Tbsp of butter and transfer the fruit mixture to the prepared casserole. Make the topping: In a mixing bowl, combine ingredients and cut together until the mixture resembles coarse crumbs. Sprinkle the topping evenly over the fruit and bake until the topping is golden brown and crispy and fruit is bubbly in places, about 45 minutes. Cool briefly and serve warm, with a dollop of whipped cream, ice cream, or crème fraiche, if desired.